Sonia Belcher’s HCHC Ambassadors are a group of carefully selected students who raise awareness about Hellenic College Holy Cross by visiting parishes and metropolises around the country. In the process, they gain invaluable experience in field education and youth ministry. The program is dedicated to the memory of its late director, Sonia Daly Belcher, whose extraordinary example of faith and service remains a vital inspiration to our community. Parishes interested in hosting HCHC Ambassadors for a retreat or youth ministry event should get in touch! Our Admissions Ambassadors are a group of energetic, outgoing undergraduate students who are carefully selected by the Office of Admissions to represent Hellenic College Holy Cross. Admissions Ambassadors serve as tour guides to prospective students, parents, and visitors and also travel nationwide to speak on behalf of the school at large events and conferences. 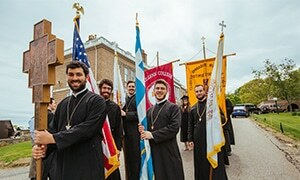 Their enthusiasm and love for our beloved school is contagious, and we value their commitment to spreading the mission of Hellenic College Holy Cross. If you are interested in having Admissions Ambassadors attend an event, conference, or speak at a parish on behalf of the school, please contact the Office of Admissions. Our Alumni Ambassadors work with the Office of Admissions to recruit students who will thrive on campus. Through authentic conversations, relationship building, and effective communication, Alumni Ambassadors spread the mission of Hellenic College Holy Cross to all students with whom they come into contact. Our Alumni Ambassadors consist of both Hellenic College and Holy Cross alumni (male and female, clergy and lay) who wish to share their experience about HCHC and truly make a difference. If you are interested in becoming an Alumni Ambassador, please contact the Office of Admissions. Presidential Ambassadors travel with the HCHC President throughout the United States to promote HCHC and to assist parishes with youth ministry programs.